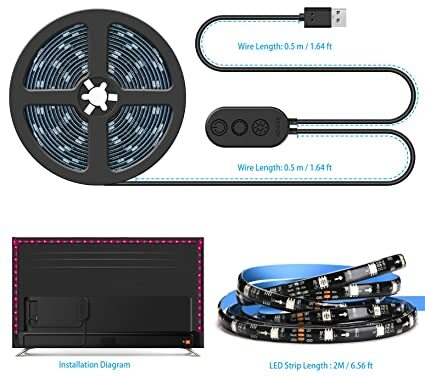 Amazon is now offering a great deal on the Minger LED Strip Light for 40″ to 60″ TVs for $9.99. When you input Coupon code “TIUB853V”, the price will cut to $7.99. ➤Alleviates eye-strain — Adds a Subtle TV backlight to your monitor, reducing the eyestrain caused by differences in picture brightness from scene to scene in movies, shows and games.Perfect mood light and can improve image clarity. ➤Multiple scenarios : 7 colors offer various atmospheres, provide you with the greatest experience. Can be mounted on TVs, PCs, home theaters or other display screens. Portable controller, no more accessories are required. ➤Easy Installation : LED strip light is 6.56ft can be cut with scissors on the cut marks to fit the desired size of your TV. Use the 3m adhesive to attach to almost any surface, powered by any devices with output 5V 2A usb port. Just plug-and-play! ➤Safe to use : LED light strip has a working voltage of 5V and are equipped with short circuit protection and memory function. IP65 waterproof, extremely low-heat, touchable and safety for children. The lights tape on the back come with an strong adhesive , easy installation.